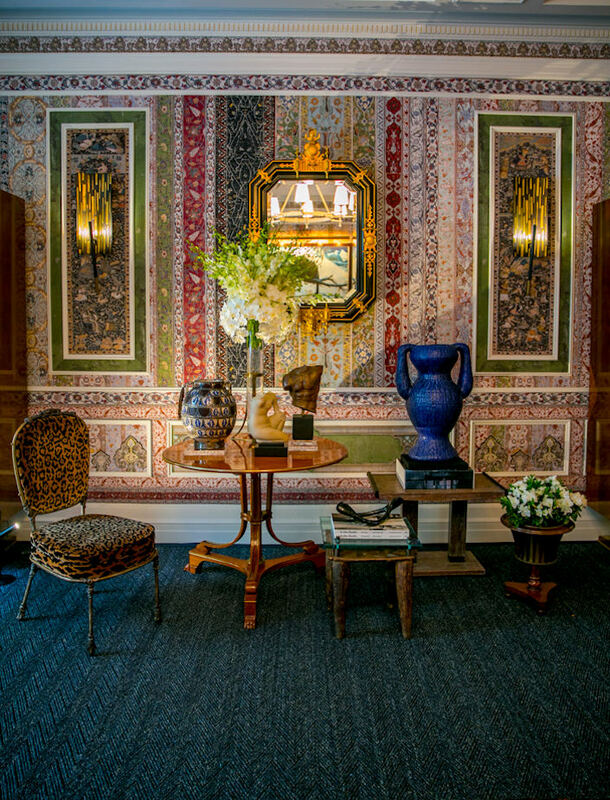 Opening on May 2, the 45th Kips Bay Decorator Show House brings the creativity of eighteen top designers and architects to 125 East 65th Street, a five story 1905 Georgian townhouse by Charles Platt. For years the headquarters of the China Institute, the building is now on the market and the designers give an idea of the versatility of the spacious rooms. 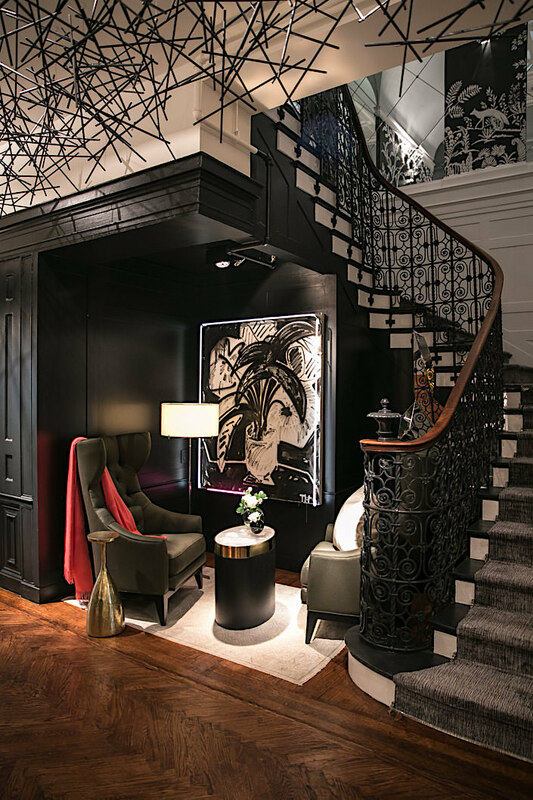 The entryway gallery by Canadian design firm Powell & Bonnell echoes the classicism of the building with a black and white theme, adding contemporary elements for a fresh mix. 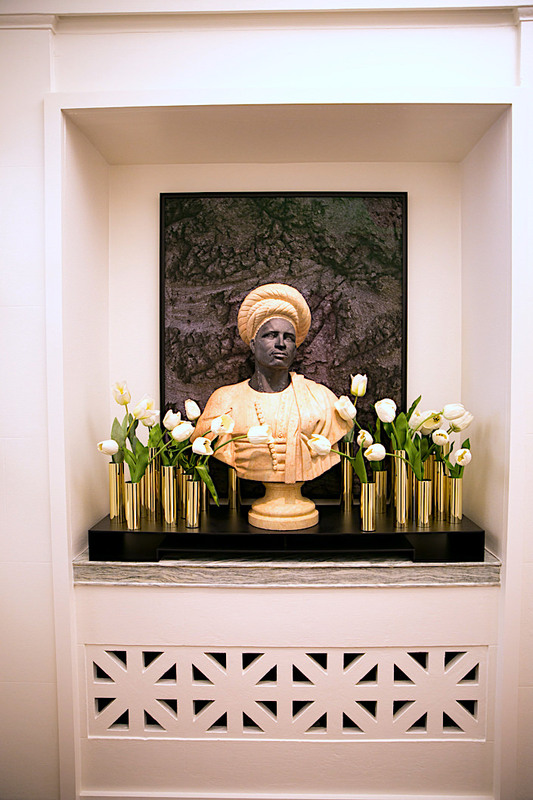 In the front hall, they continued the theme with a reverse color scheme. Against black walls, a small seating area has added drama with a neon framed painting and modern steel ceiling installation. 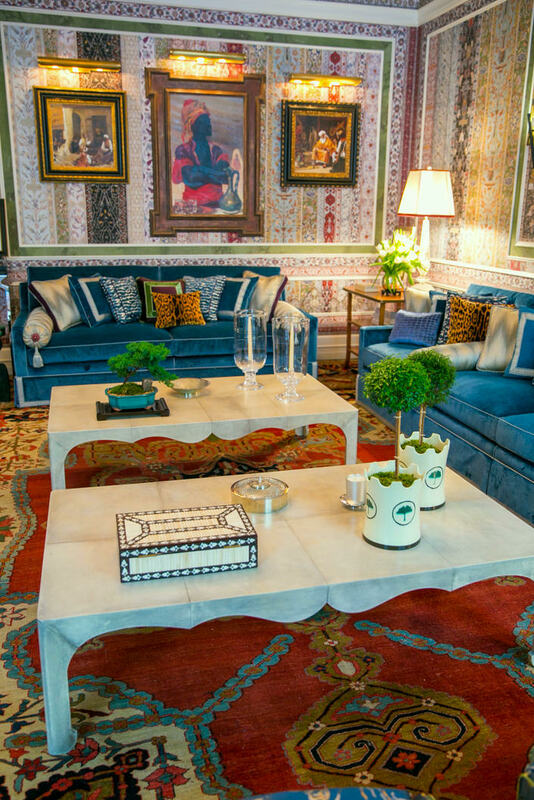 Richard Mishaan‘s showstopping sitting room is an ode to travel, craftsmanship and heritage. 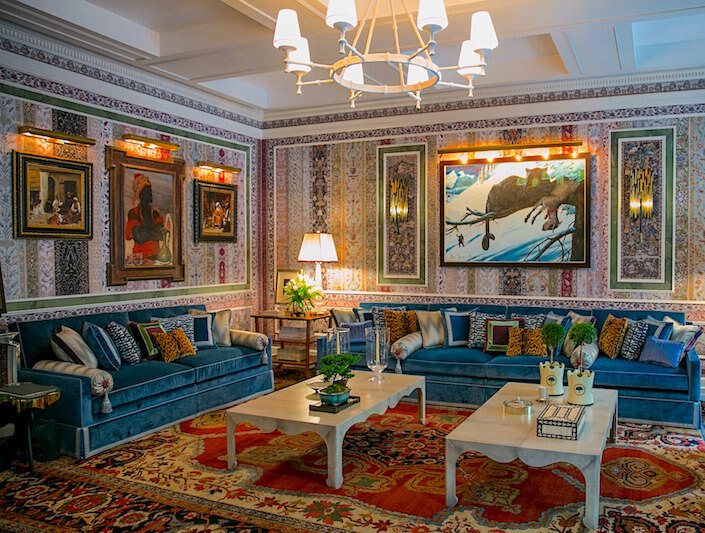 With a nod to the maximalist interiors of Renzo Mongiardino, Mishaan emulates the layered sophistication of artistic spaces like those in Venetian palaces that have been created over time, often including acquisitions from far flung locations around the globe. 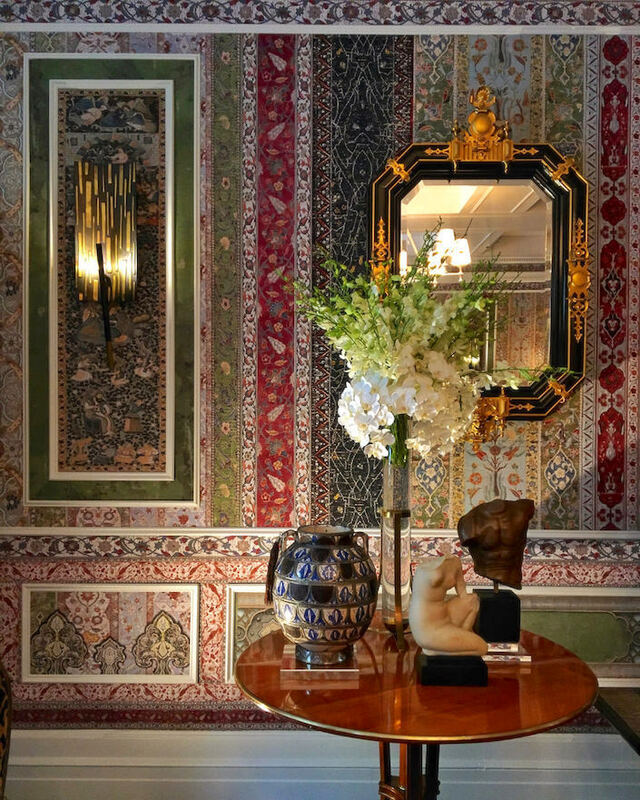 Likewise, Mishaan’s globally inspired room is anchored by an intricate Iksel wallpaper, Rumi, printed in London, based on the design of hand painted wooden walls from a 17th c. house in Aleppo, Syria, now installed in the Pergamon Museum in Berlin. An enormous 19th century Persian Serapi rug from Hakimian continues the dialogue of exotic pattern and antiquity. 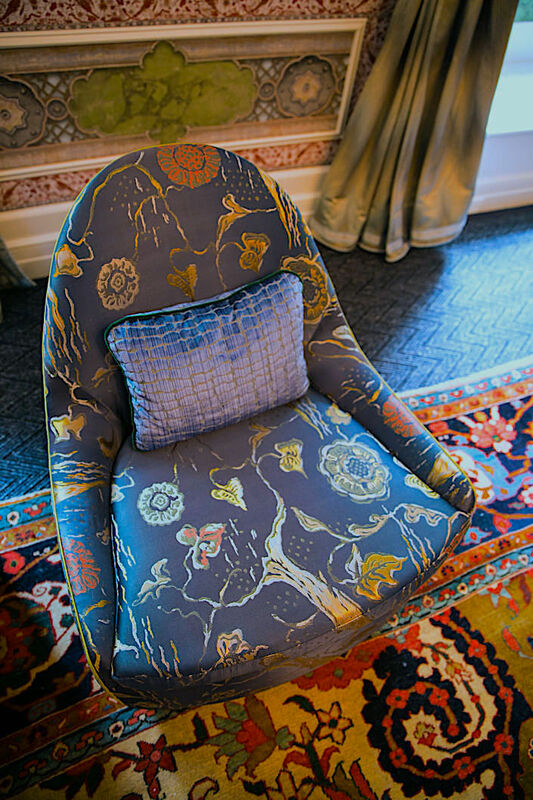 Eclectic pieces help tell the global story. Above, a rare Edouard Lievre mirror reveals the painter’s interest in Japanese styles melded with gilding of French Rococo style. And a large Peter Schlesinger gourd adds a contemporary flair for color and texture. 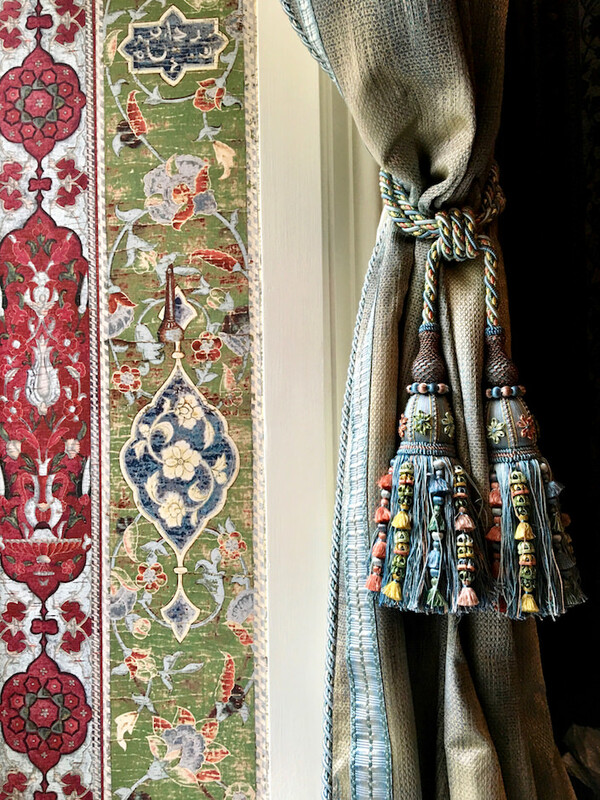 Layering in artisanal textiles, including Fortuny and many hand loomed silks from Venice’s Bevilacqua, bespoke accessories and a curated selection of decorative arts, the room feels both timeless and of our time. 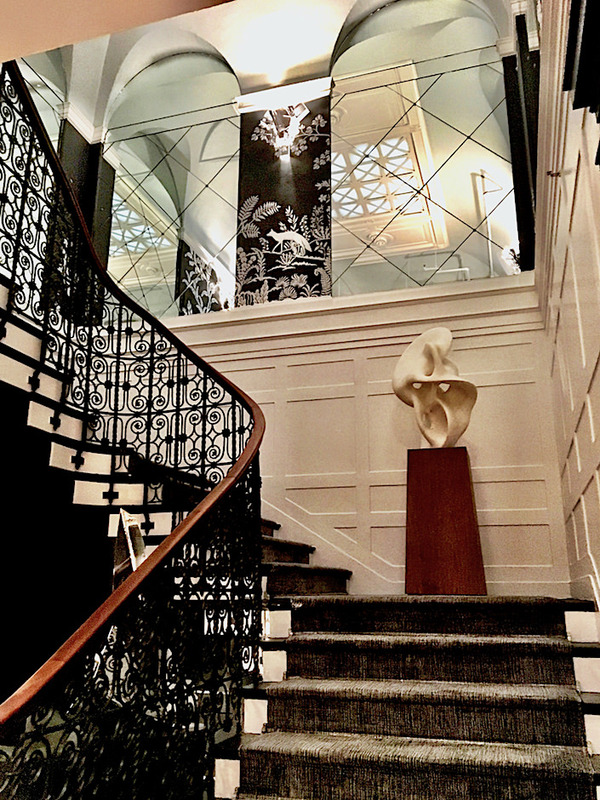 Looking to accentuate the classic architecture of the building, designer Jonathan Savage created an enveloping yet dramatic solution for the stairway and landing. as you approach the landing, where a Stephen Antonson console (not pictured) adds artistic flair to the seating area. 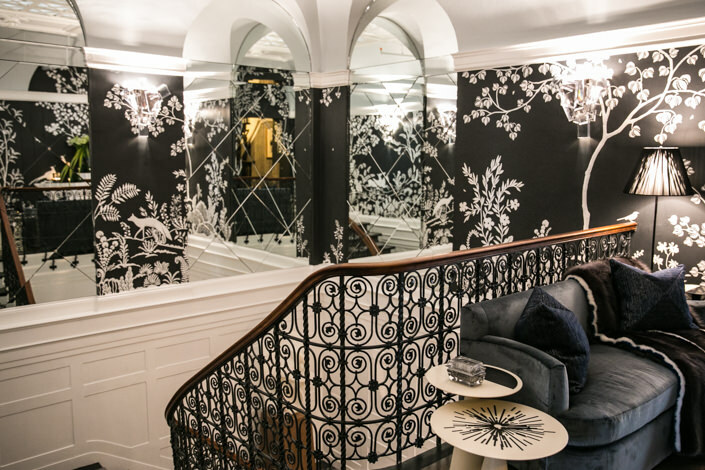 Stop back next time as we move upstairs for more from the 45th Kips Bay Decorator Show House. This entry posted in architecture, art, interior design. 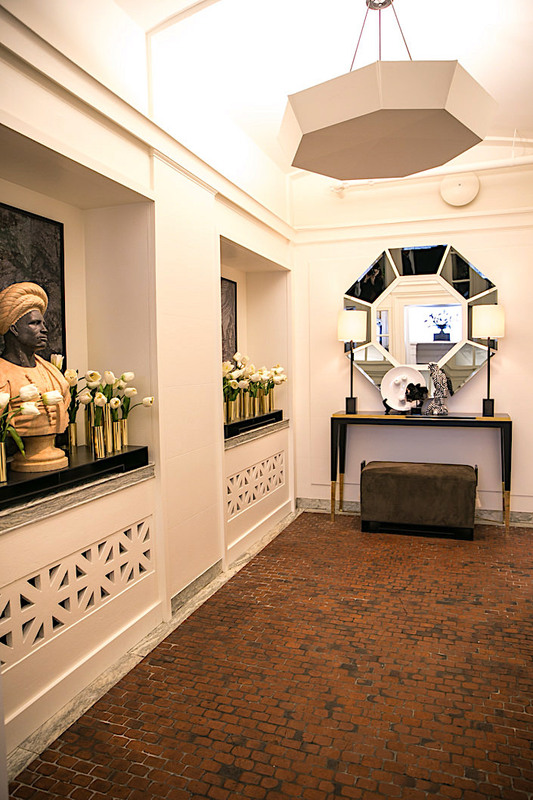 Entry Tags: interior design, Kips Bay decorator show house Bookmark the permalink. It’s gorgeous and very maximalist. More is more. Just as with extremely minimalist places, I wouldn’t want to live there myself, but I would want to be best friends with the resident so I could visit very often. 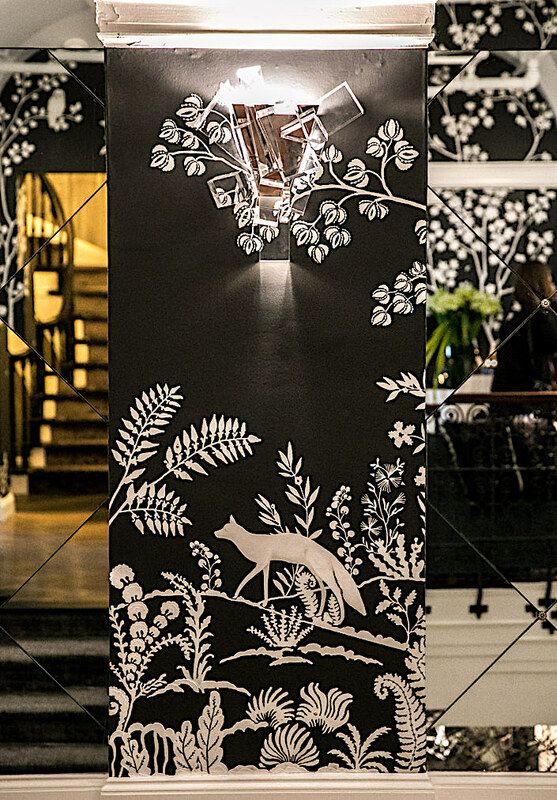 Kips Bay is a signature event of spring in New York, always anticipated and never disappointing. My hands down favorite on the first floor? 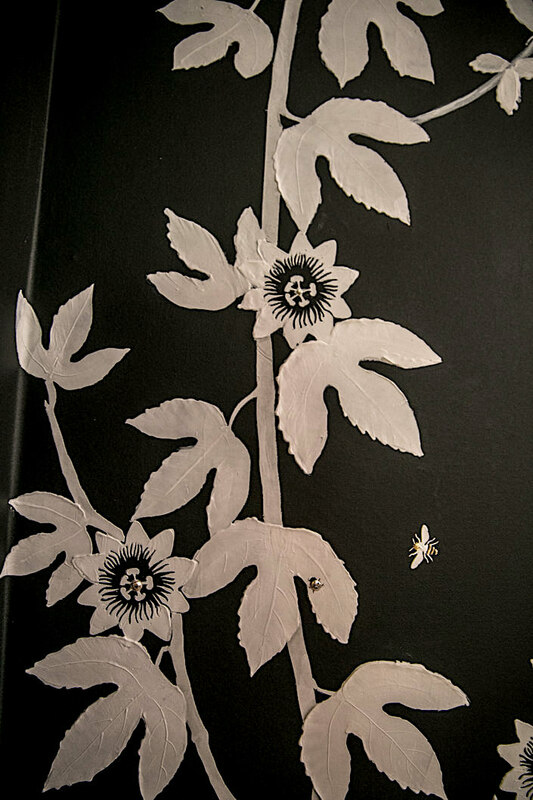 The Iksel wallpaper…Wow! The designer could have stopped there but I’m glad he didn’t. Maximalism is IN! We are all grateful for that. So glad this room is getting the attention it deserves. 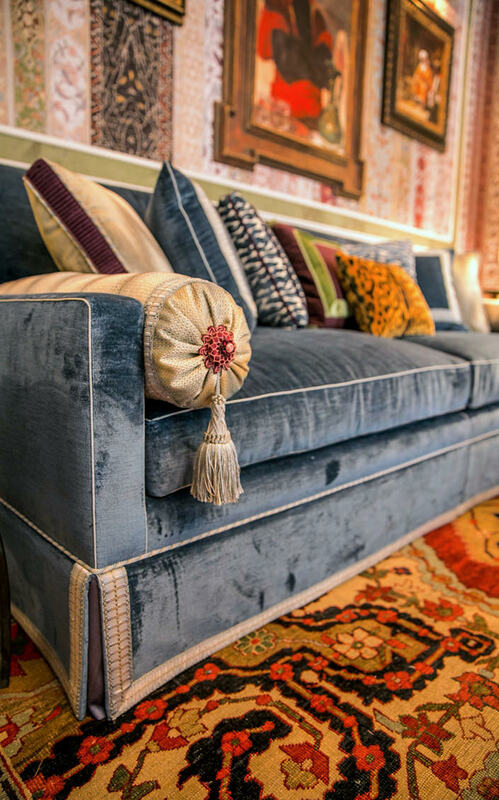 Astoundingly rich in color, texture and chinoiserie effects creates what I love most, drama! I’ll be thrilled to see what comes next. 81 queries in 0.490 seconds.